Having a pet to share your life can be a rewarding, magical experience. However, before buying or rescuing a pet, consider the pros and cons of both options in order to ensure that you and your new companion are able to live together in a healthy, happy environment. So should you buy or find your dream animal companion at a rescue shelter? Rescue Dogs waiting for a new home. – You can choose the specific breed of animal you want. – You can even order a special hybrid or mixed breed of pet you like. Some pet owners, for example, can order a special dog breed mix such as a labradoodle, a cockapoo or a schnoodle. – Most breeders and sellers offer young animals such as puppies that are often easier to train than adults are. – You could be buying from an unscrupulous breeder, a puppy mill or an animal broker. – Even if you pick up a pet from a popular pet shop, it is still possible that the animal came from a breeder with questionable practices or a broker that works with this type of breeder. – Buying encourages the business of unscrupulous pet breeding, so you may be contributing to the problem without you being aware of it. Rescued pets come in all types and breeds. Some of them may be strays, abandoned or rescued from abusive homes, pet hoarders, mass-breeding facilities, illegal animal fighting rings and even other shelters. – Sharing your home with a rescued animal allows you to rescue it from a life of neglect and abuse and give it a good home. – Getting a rescued animal means saving it from a life spent in a cage or an unhealthy environment. – Taking a rescued animal home means taking it off a shelter which is often overcrowded with new arrivals. – If the animal happens to stay in a rescue shelter that euthanizes its animal residents, you could help give your pet a new lease on life. – It is possible to adopt an animal that has already been trained, housebroken or even know how to do a few tricks. – Animals sent to live in shelters often come in a wide range of breeds and maturity, so if you have preferred breed and age in mind, it is possible you will find what you are looking for. – Many rescued animals are already adults with set habits and behavior patterns, some of which new potential owners may not be comfortable with. 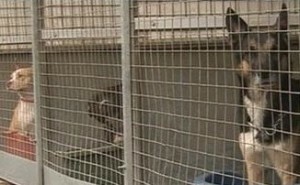 – Some shelters do not train the animals they rescue, so it is often up to the buyer to teach the animal how to behave. – Adopting from a shelter often comes with a lot of paperwork and detailed interviews that may require you to answer personal questions. Animals are often welcome companions to loving, responsible pet owners. Always consider your options carefully before making a decision. This will help ensure that the new pet will adapt well to your home and increase the likelihood of a happy, healthy pet-human relationship.